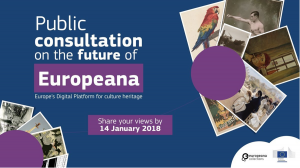 The Commission has launched a public consultation on Europeana, Europe’s Digital Platform for Cultural Heritage (www.europeana.eu) that DG CNECT is funding. Europeana currently provides access to over 53 million items, (including image, text, sound, video and 3D material) from the collections of over 3,700 libraries, archives, museums, galleries and audio-visual collections across Europe. The platform can be used by professionals in cultural and creative fields, researchers, teachers, students and everyone interested in digital culture. The Commission would like to hear from citizens, professionals and organisations about their experience and expectations of Europeana. The results will help direct the future development of Europeana. More information on the public consultation at the following link. Please find attached the Commission’s press release and additional dissemination material as reference.